Raine Karp (born 1939) is one of the masters of modern architecture in Estonia whose original and wide-ranging oeuvre holds permanent value both in local art of building as well as the architecture of the whole region. With an active career spanning over five decades, Karp has designed about 300 projects, which typologically range from garden houses and bus stations to the Linnahall building and the National Library of Estonia. The current exhibition focuses on Karp’s private houses and summer homes from the Soviet era. Karp has always emphasised the fact that creating a home for a person is an important part of the architect’s job. The exhibited projects were drawn in his home studio during evenings after the day job in the State Design Institute Eesti Projekt. Owning a private corner in collective society, whether it is self-built house or only a small summer home, was in a way resistance to the Soviet regime. Of course private houses were built all over the former Soviet Union, but in Estonia’s case it is noteworthy that many houses were built using unique designs by local well-known architects. That considerably raised the spatial quality of houses in the otherwise monotonous world of Soviet standardised designs. The end of Soviet period almost coincides with the time when Karp changed his drawing board for a computer in 1990, so the exhibited designs also belong technologically to another era and the exhibition emphasises the beauty of hand-drawn architectural drawing. 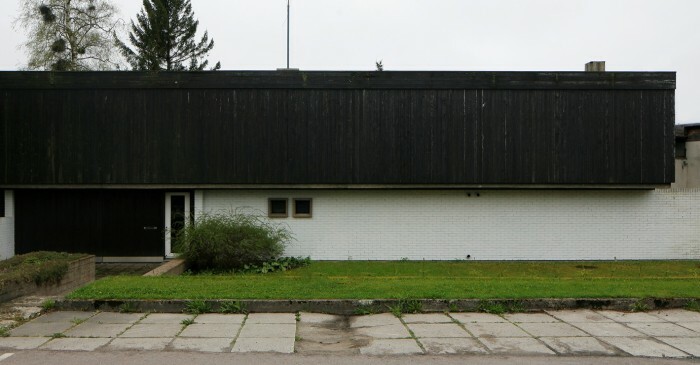 Under special consideration is Karp’s own house in the Merivälja district, Tallinn (1968–1975), which is one of the most famous modern dwellings in Estonian architecture. Besides different design versions, the model of the house from the Museum’s collection is exhibited which is supplemented by a unique slide show of the almost 10-years long building process of the house, photographed by Karp himself. For the first time is shown the initial draft design from 1966 which differs substantially from the well-known end result. The exhibition complements the recently published book “Architect Raine Karp” (editors Raine Karp, Mait Väljas), which was presented in May at the National Library of Estonia. Richly illustrated with photos and drawings, the book presents the architect’s works in all their diversity, containing large scale celebrated buildings (the Linnahall, the National Library, the Sakala Centre which was demolished in 2007) as well as a wide variety of housing architecture up to this day. The exhibition is opened until 21st August 2016.